Trips for Kids (TFK) proudly announces its 25th Anniversary Gala Dinner and Auction raised close to $95,000 for its youth cycling programs. More than 200 patrons enjoyed an evening of wine, food, music, live auction, a 25-year retrospective and a keynote address by Dr. Shimon Schocken, founder of the Rides of Hope mountain bike club of Mizpe-Yam, a juvenile correction facility located near Tel Aviv. Hosted by San Francisco Bay Area TV personality Doug McConnell, the evening included cycling celebrity guests Gary Fisher, Juli Furtado, Tom Ritchey and Maurice Tierney, and support from industry giants and honorary board members including actor Robin Williams. "The evening was magical. I loved seeing so many people who are passionate about bicycling and about the Trips for Kids mission assembled together in one room to share in the moment. 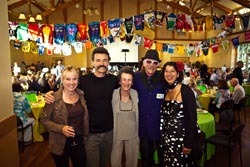 The event was a tribute to the generosity of hundreds of individual donors, companies, foundations and members of the cycling industry that have supported us throughout the years," said Founding Director Marilyn Price, who holds a place in the Mountain Bike Hall of Fame for her work with Trips for Kids. "We were excited to see Tom, Juli, Gary and Maurice and our many devoted long time supporters." "Having the opportunity to participate in this historic moment and to meet the people behind the Trips for Kids organization was a privilege and an inspiration," said Dr. Shimon Schocken. "Although Rides of Hope and Trips for Kids are several continents apart, we share the same mission to use mountain biking to help at risk children." "Along with my wife, I was honored to be a part of the Trips for Kids 25th celebration," said Tom Ritchey, Mountain Bike Hall of Famer and founder of Ritchey Design. "The heart and care that this program brings to children in need is what motivates me to continue my enthusiastic support for Trips for Kids." The evening's highest bidders went home with spectacular items including a Bianchi San Jose bike donated and signed by Robin Williams, a P29er frame handmade by Tom Ritchey, an Above Category Cielo Sportif classic handmade by Chris King, a Santa Cruz Juliana mountain bike donated by World Cup champion Juli Furtado, a Specialized Globe Daily 2 Urban Commuter Bike, a Western Spirit mountain bike trip on the White Rim Trail and a Primal Wear custom cycling kit. Trips for Kids is a national 501(c)3 nonprofit based in San Rafael, California. Trips for Kids started in 1988 as a grass roots effort by avid mountain biker, environmentalist, and Mountain Bike Hall of Fame inductee, Marilyn Price. Its programs give underserved youth a chance to experience the joy and challenge of mountain biking, while learning valuable life skills and an appreciation for the outdoors. There are currently 74 Trips for Kids chapters across the United Stated and Canada, and 2 chapters in Israel.